A Nigerian terror suspect accused of trying to help al-Qaeda in Yemen appeared before a United States federal courtroom on Friday. Judge John Gleason ordered Babafemi, also known as 'Ayatollah Mustafa,' held without bail. No plea was entered, reports NBCnewyork.com. Prosecutors said Babafemi is married with children in Nigeria and helped al-Qaeda attempt to recruit people who speak English to engage in acts of terror against Americans. The FBI said Anwar al-Awlaki, the American cleric who became the al-Qeada commander in the Arabian Peninsula and was killed in a US drone strike, personally directed $9,000 be paid to Babafemi to assist in his recruitment efforts. 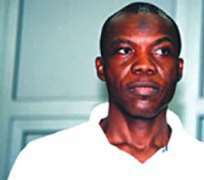 Investigators said Babafemi was active with al-Qaeda operatives from 2010 to 2011 until he was arrested for crimes in Nigeria. He was then turned over to FBI agents to be prosecuted for his alleged terrorist activity. 'The defendant threw his efforts behind al-Qaeda in the Arabian Peninsula's media, recruitment, and weapons training campaigns in an effort to strengthen the terrorist group's grip on the region and extend its reach throughout the world,' US Attorney Loretta Lynch said in a statement. His transfer to the United States comes amid increasing concerns about the growing footprint of al-Qaeda affiliated organizations in Africa. Al-Qaeda in Yemen has tried to use an underwear bomb on an airliner heading to Detroit and has hidden explosives in printers to try to bomb cargo planes. Al Shabaab - a Somali-based group linked to al-Qaeda - is believed to be behind the recent mall attack in Kenya.